Warren Miller Entertainment is the most respected name in action-sports filmmaking, capturing the best of winter sports each year since 1949. In addition to producing and touring an international, award-winning feature-length snow-sports film, Warren Miller Entertainment has a thriving television programming, development and production arm and is a leading source for snow and action-sports stock footage. All films and programming are produced and distributed from the company’s Boulder, Colorado, corporate headquarters. For nearly 70 years, Warren Miller Entertainment has produced the largest, most established and successful action sports films today, reaching more skiers than any other snowsports film in history. The Warren Miller Film Tour serves as the official kick off to winter and tours the U.S. from October to December, annually. 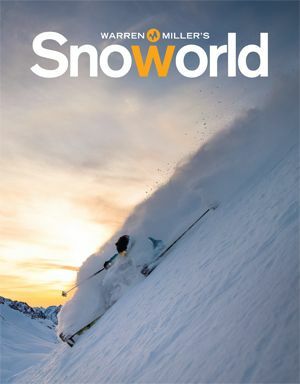 Snoworld magazine gives its readers a behind the scenes look into the making of the production, the film locations, and athlete profiles – all alongside stunning still images from the movie. Warren Miller once said, “since time began, snow melts every spring. The only constants we really have are water, gravity, our search for freedom and our instinct to return to the sea.” Warren Miller Entertainment continues to promote excellence in entertainment, event experiences and four season content solutions for attendees, sponsors, clients and athletes. Warren Miller was selected by America’s Cup to produce unique and compelling content on-location during its event series. Partners and brands can also tap into Warren Miller Entertainment’s operations experience and expertise to produce, host, or tour a film or film festival. To find out more contact us below. View the next sneak preview!